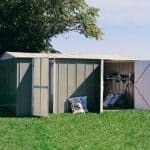 A large metal garage doesn’t have to be silver or grey and look like all the others, as this attractive example from Store More demonstrates. It has an attractive green design with cream detailing, and so we feel it complements a garden rather than detracting from it. 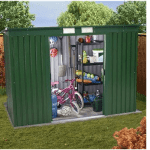 It’s also a very versatile structure, as its size means that even when a car is parked inside there’s lots of storage space available as well. Accessing this extra space is quick and simple, thanks to the side personnel door as well as a large up and over front door. Because there are no window this can be a secure environment as well, but you’ll need to add a pair of padlocks and an alarm system for this purpose. 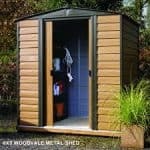 If you plan to use this as a metal workshop you’ll also need to install some lighting, but thanks to the inbuilt ventilation you’ll be surprised how airy it feels inside. The large apex roof gives a very high eaves height, and also ensures that rain or snow is carried harmlessly away. The galvanised steel is also very water resistant, which is why the manufacturer has given a 10 year warranty against perforations caused by rust. We were impressed by the good looks of this metal garage on first sight, as it catches the eye not only for its large and imposing dimensions but also for its unique colour scheme. The dominating colour is a dark green, with off white trim around the air vents and doors, and the paint is impeccably applied which is a good indicator of the high quality we would find throughout. The shed is more than wide and deep enough for a typical family car, with these dimensions measuring 3.72m and 7.85m respectively when the overhang is taken into account, but it was the height that really impressed us. The rain deflecting apex roof creates a ridge height of 2.59m and an eaves height of 2.10m, which is as tall as any we see on the garages we review. It means that even when a car is inside, there’s still lots of vertical storage space available. Cladding is all important on metal workshops and garages, as strong cladding creates stability in windy conditions and ensures that it retains its original looks for years to come. Thankfully that’s what we found here, with the cladding having gone through a hot dipped galvanisation process. It means that the original steel is bonded with zinc, giving it extra toughness and rigidity. With a strong reinforced frame as well, the walls and roof feel very secure when assembly is complete. As usual with metal buildings there is no floor included. That’s because the customer is expected to fix the garage directly onto a level area of concrete. To do this, however, an anchor kit or set of fixing screws are needed, and we were disappointed to see that these weren’t included as standard. With high quality galvanised cladding used for all the external surfaces, this building is very resistant to rain and snow. It’s also, of course, free from concerns about rot, warping, or insect attacks. These are the advantages that a metal structure brings compared to a wooden one, and is why this garage comes with a 10 year warranty against rust perforations. This is reassuring in itself, although we think that the warranty period could have been even more generous given the excellent weather defences displayed here. 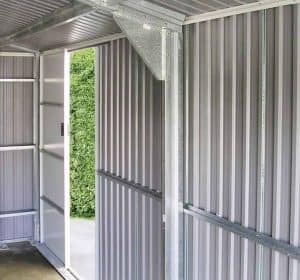 Another advantage of a metal building, of course, is that there are no retreatment requirements for the owner to carry out once it’s been installed. A large door makes getting in and out of the garage so much easier, and that’s certainly what we found here. 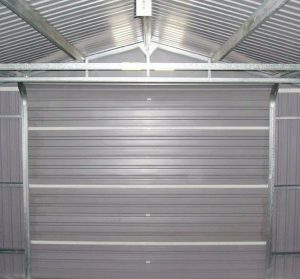 The main door is a roll up and over door so typical of metal garages and is 2.52m wide and 2.05m high, so even tall and wide vehicles should have no problems getting through the opening. We were also pleased to see that there is a side access door measuring 0.69m wide and again 2.01m high. This can be positioned on either side during the assembly process and allows access to the plentiful space that can be left at the rear of the garage. There are no windows included, but one thing we did appreciate is the vented gables, as the fresh air they allow in can prove invaluable if the building is to be used as a workshop. The window free design makes it impossible for passers by to determine whether anything of value is being kept inside, and so we welcome this as a useful security feature. On the whole, however, we would have liked to see padlocks and maybe even an alarm included as standard. Instead, both doors are padlockable but it’s left to the customer to supply and fit their own locking system. We feel that a pair of high quality padlocks are an essential purchase for a garage rather than an optional extra, although at least they can be purchased at relatively little expense. The same can be said of a fixing kit, and one option available is to use a set of Hilti screws for this purpose. 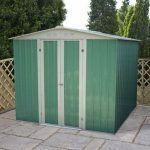 They can be purchased with the garage at an extra cost of £17, but as the building itself costs over two thousand pounds, we think it would have made sense to include them with the standard package. We were pleased to see that even in a building of this size there was no corner cutting, and high quality components were used throughout. Hot dipped galvanised steel is a very tough substrate with few natural enemies, so it could last much longer than its 10 year warranty suggests. 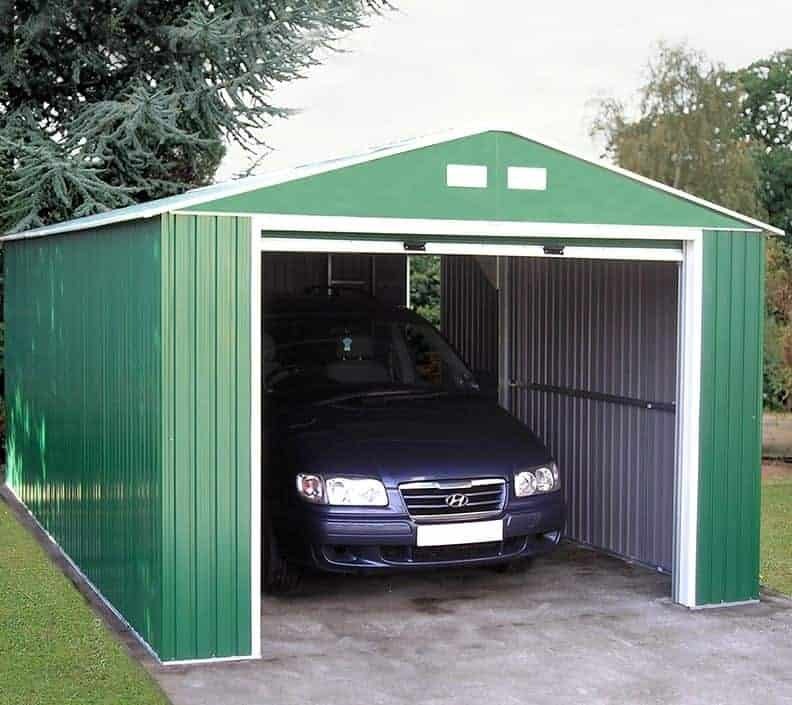 We have reviewed metal garages that are even longer than this one, but the extra head height here creates an accommodating storage space for cars and more. 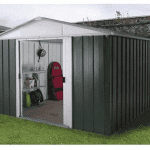 With a friends help you may be able to install this garage in as little as ten hours, but due to its size and the number of components involved we would advise setting aside two days for the process. Even with a price tag of well over two thousand pounds, we feel this represents reasonable value for money when its size and durability are taken into account. Final Thoughts: If you want a large scale garage that is completely maintenance free and yet looks good as well, then this could be just what you’re looking for. Metal garages offer natural benefits over timber buildings in this area, and we liked the green painted finish of this one as well. We can imagine lighting sources being installed in this building, at which point the space it offers, its two doors, and natural source of ventilation would make it an ideal workshop. Whichever purposed it’s to be used for a pair of padlocks will be a necessary purchase, but once they’re added the window free design creates a secure environment.